What is the difference between returning IQueryable<T> vs. IEnumerable<T>? Will both be deferred execution and when should one be preferred over the other? Yes, both will give you deferred execution. The difference is that IQueryable<T> is the interface that allows LINQ-to-SQL (LINQ.-to-anything really) to work. So if you further refine your query on an IQueryable<T>, that query will be executed in the database, if possible. The top answer is good but it doesn't mention expression trees which explain "how" the two interfaces differ. Basically, there are two identical sets of LINQ extensions. Where(), Sum(), Count(), FirstOrDefault(), etc all have two versions: one that accepts functions and one that accepts expressions. When using Where() on an IQueryable collection, the compiler passes an expression tree to Where(). An expression tree is like the reflection system but for code. The compiler converts your code into a data structure that describes what your code does in a format that's easily digestible. Why bother with this expression tree thing? I just want Where() to filter my data. The main reason is that both the EF and Linq2SQL ORMs can convert expression trees directly into SQL where your code will execute much faster. Oh, that sounds like a free performance boost, should I use AsQueryable() all over the place in that case? No, IQueryable is only useful if the underlying data provider can do something with it. Converting something like a regular List to IQueryable will not give you any benefit. It approximately takes 90 seconds to run that block of code against a WebLog table which has 1 million records. So, all table records are loaded into memory as objects, and then with each .Where() it will be another filter in memory against these objects. It approximately takes four seconds to run this block of code using IQueryable. IQueryable has a property called Expression which stores a tree expression which starts being created when we used the result in our example (which is called deferred execution), and at the end this expression will be converted to an SQL query to run on the database engine. Both will give you deferred execution, yes. As for which is preferred over the other, it depends on what your underlying datasource is. Returning an IEnumerable will automatically force the runtime to use LINQ to Objects to query your collection. Returning an IQueryable (which implements IEnumerable, by the way) provides the extra functionality to translate your query into something that might perform better on the underlying source (LINQ to SQL, LINQ to XML, etc.). Return IQueryable<T> if you want to enable the developer using your method to refine the query you return before executing. Return IEnumerable if you want to transport a set of Objects to enumerate over. Imagine an IQueryable as that what it is - a "query" for data (which you can refine if you want to). An IEnumerable is a set of objects (which has already been received or was created) over which you can enumerate. In general you want to preserve the original static type of the query until it matters. For this reason, you can define your variable as 'var' instead of either IQueryable<> or IEnumerable<> and you will know that you are not changing the type. If you start out with an IQueryable<>, you typically want to keep it as an IQueryable<> until there is some compelling reason to change it. The reason for this is that you want to give the query processor as much information as possible. For example, if you're only going to use 10 results (you've called Take(10)) then you want SQL Server to know about that so that it can optimize its query plans and send you only the data you'll use. A compelling reason to change the type from IQueryable<> to IEnumerable<> might be that you are calling some extension function that the implementation of IQueryable<> in your particular object either cannot handle or handles inefficiently. In that case, you might wish to convert the type to IEnumerable<> (by assigning to a variable of type IEnumerable<> or by using the AsEnumerable extension method for example) so that the extension functions you call end up being the ones in the Enumerable class instead of the Queryable class. IEnumerable is a collection of objects in memory that you can enumerate - an in-memory sequence that makes it possible to iterate through (makes it way easy for within foreach loop, though you can go with IEnumerator only). They reside in the memory as is. IQueryable is an expression tree that will get translated into something else at some point with ability to enumerate over the final outcome. I guess this is what confuses most people. They obviously have different connotations. IQueryable represents an expression tree (a query, simply) that will be translated to something else by the underlying query provider as soon as release APIs are called, like LINQ aggregate functions (Sum, Count, etc.) or ToList[Array, Dictionary,...]. And IQueryable objects also implement IEnumerable, IEnumerable<T> so that if they represent a query the result of that query could be iterated. It means IQueryable don't have to be queries only. The right term is they are expression trees. Now how those expressions are executed and what they turn to is all up to so called query providers (expression executors we can think them of). In the Entity Framework world (which is that mystical underlying data source provider, or the query provider) IQueryable expressions are translated into native T-SQL queries. Nhibernate does similar things with them. You can write your own one following the concepts pretty well described in LINQ: Building an IQueryable Provider link, for example, and you might want to have a custom querying API for your product store provider service. So basically, IQueryable objects are getting constructed all the way long until we explicitly release them and tell the system to rewrite them into SQL or whatever and send down the execution chain for onward processing. As if to deferred execution it's a LINQ feature to hold up the expression tree scheme in the memory and send it into the execution only on demand, whenever certain APIs are called against the sequence (the same Count, ToList, etc.). The proper usage of both heavily depends on the tasks you're facing for the specific case. For the well-known repository pattern I personally opt for returning IList, that is IEnumerable over Lists (indexers and the like). So it is my advice to use IQueryable only within repositories and IEnumerable anywhere else in the code. Not saying about the testability concerns that IQueryable breaks down and ruins the separation of concerns principle. If you return an expression from within repositories consumers may play with the persistence layer as they would wish. A little addition to the mess :) (from a discussion in the comments)) None of them are objects in memory since they're not real types per se, they're markers of a type - if you want to go that deep. But it makes sense (and that's why even MSDN put it this way) to think of IEnumerables as in-memory collections whereas IQueryables as expression trees. The point is that the IQueryable interface inherits the IEnumerable interface so that if it represents a query, the results of that query can be enumerated. Enumeration causes the expression tree associated with an IQueryable object to be executed. So, in fact, you can't really call any IEnumerable member without having the object in the memory. It will get in there if you do, anyways, if it's not empty. IQueryables are just queries, not the data. There is a blog post with brief source code sample about how misuse of IEnumerable<T> can dramatically impact LINQ query performance: Entity Framework: IQueryable vs. IEnumerable. The first one returns enumerable iterator, and the second one creates query through the query provider, specified in IQueryable source. I recently ran into an issue with IEnumerable v. IQueryable. The algorithm being used first performed an IQueryable query to obtain a set of results. These were then passed to a foreach loop, with the items instantiated as an Entity Framework (EF) class. This EF class was then used in the from clause of a Linq to Entity query, causing the result to be IEnumerable. I'm fairly new to EF and Linq for Entities, so it took a while to figure out what the bottleneck was. Using MiniProfiling, I found the query and then converted all of the individual operations to a single IQueryable Linq for Entities query. The IEnumerable took 15 seconds and the IQueryable took 0.5 seconds to execute. There were three tables involved and, after reading this, I believe that the IEnumerable query was actually forming a three table cross-product and filtering the results. Try to use IQueryables as a rule-of-thumb and profile your work to make your changes measurable. I would like to clarify a few things due to seemingly conflicting responses (mostly surrounding IEnumerable). In other words, IEnumerables are not exclusively "in-memory". IQueryables are not always executed on the database. IEnumerable must load things into memory (once retrieved, possibly lazily) because it has no abstract data provider. 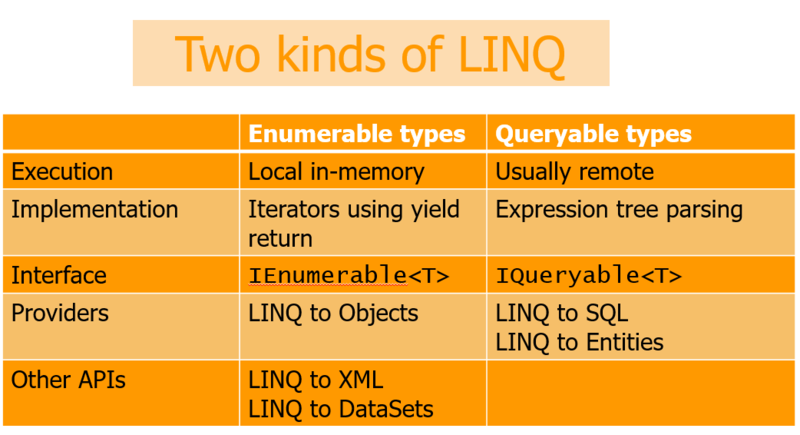 IQueryables rely on an abstract provider (like LINQ-to-SQL), although this could also be the .NET in-memory provider. (1) The IEnumerable attempts lazy loading and your data context is expired. Exception thrown because provider is no longer available. (2) Entity Framework entity proxies are enabled (the default), and you attempt to access a related (virtual) object with an expired data context. Same as (1). (3) Multiple Active Result Sets (MARS). If you are iterating over the IEnumerable in a foreach( var record in resultSet ) block and simultaneously attempt to access record.childEntity.childProperty, you may end up with MARS due to lazy loading of both the data set and the relational entity. This will cause an exception if it is not enabled in your connection string. I have found that enabling MARS in the connection string works unreliably. I suggest you avoid MARS unless it is well-understood and explicitly desired. Execute the query and store results by invoking resultList = resultSet.ToList() This seems to be the most straightforward way of ensuring your entities are in-memory. In cases where the you are accessing related entities, you may still require a data context. Either that, or you can disable entity proxies and explicitly Include related entities from your DbSet. The main difference between “IEnumerable” and “IQueryable” is about where the filter logic is executed. One executes on the client side (in memory) and the other executes on the database. For example, we can consider an example where we have 10,000 records for a user in our database and let's say only 900 out which are active users, so in this case if we use “IEnumerable” then first it loads all 10,000 records in memory and then applies the IsActive filter on it which eventually returns the 900 active users. While on the other hand on the same case if we use “IQueryable” it will directly apply the IsActive filter on the database which directly from there will return the 900 active users. We can use both for the same way, and they are only different in the performance. IQueryable only executes against the database in an efficient way. It means that it creates an entire select query and only gets the related records. For example, we want to take the top 10 customers whose name start with ‘Nimal’. In this case the select query will be generated as select top 10 * from Customer where name like ‘Nimal%’. But if we used IEnumerable, the query would be like select * from Customer where name like ‘Nimal%’ and the top ten will be filtered at the C# coding level (it gets all the customer records from the database and passes them into C#). IEnumerable interface is in the System.Collections namespace. The IEnumerable object represents a set of data in memory and can move on this data only forward. The query represented by the IEnumerable object is executed immediately and completely, so the application receives data quickly. When the query is executed, IEnumerable loads all the data, and if we need to filter it, the filtering itself is done on the client side. IQueryable interface is located in the System.Linq namespace. The IQueryable object provides remote access to the database and allows you to navigate through the data either in a direct order from beginning to end, or in the reverse order. In the process of creating a query, the returned object is IQueryable, the query is optimized. As a result, less memory is consumed during its execution, less network bandwidth, but at the same time it can be processed slightly more slowly than a query that returns an IEnumerable object. If you need the entire set of returned data, then it's better to use IEnumerable, which provides the maximum speed. If you DO NOT need the entire set of returned data, but only some filtered data, then it's better to use IQueryable. Not the answer you're looking for? Browse other questions tagged c# linq linq-to-sql ienumerable iqueryable or ask your own question. Why IEnumerable<T> method call the database without condition? Am I misunderstanding LINQ to SQL .AsEnumerable()? How do I add a new record to an IQueryable variable? List, IList, IEnumerable, IQueryable, ICollection, which is most flexible return type? Convert an IQueryable linq query to IEnumerable<T> cancels out linq optimized way to work? Differences between IQueryable, List, IEnumerator?